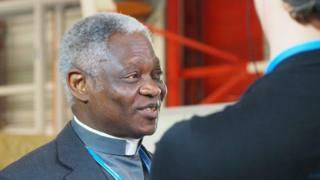 Cardinal Peter Turkson, the Pope's leading adviser on climate issues, told the BBC that the Church had never been against natural family planning. Speaking in Paris, the cardinal called for a strong agreement that would protect the most vulnerable nations. He said climate change was a looming ecological disaster. Cardinal Turkson is believed to have played a significant role in the drafting of "Laudato Si", the Pope's encyclical on climate change. The Catholic Church has recently adopted a more active role on the issue, encouraging churchgoers to join global climate marches before the start of COP21. The Church has also increased its engagement with the UN climate negotiation process itself, here in Le Bourget. "This has been talked about, and the Holy Father on his trip back from the Philippines also invited people to some form of birth control, because the church has never been against birth control and people spacing out births and all of that. So yes, it can offer a solution," he said. "Having more mouths to feed is a challenge for us to be productive also, which is one of the key issues being treated over here, the cultivation and production of food, and its distribution. "So yes it engages us in food security management, so we ensure that everybody is fed and all of that. The amount of population that is critical for the realisation of this is still something we need to discover, yet the Holy Father has also called for a certain amount of control of birth." Cardinal Turkson was at pains to stress that artificial birth control methods such as the contraceptive pill were still beyond the pale as far as the Church was concerned. "You don't deal with one good with another evil: the Church wants people to be fed, so let's do what the Church feels is not right? That is a kind of sophistry that the church would not go for," he said. The question of birth control has long been controversial within the Catholic Church. The issue is especially controversial in relation to climate change. The global population of 7 billion people is expected to grow to 9.7bn by the middle of the century according to the UN. However, efforts to limit family size in developing countries have been criticised as a form of imperialism. As well as reiterating the Church's belief in natural methods of birth control, as a way of dealing with some impacts of climate change, Cardinal Turkson said a strong agreement at the Paris climate talks would be critically important in tackling the causes of the problem. "For us, one thing must dominate. We need to look at the front line states and what they are going through now, and in the light of concern for what they are feeling now, to simply adopt a measure that can ensure the existence of all of us. "Our profession of love for God must necessarily lead to our love for the handwork of God, for what God has made, so let's have some love for creation and for the human beings."